Happy New Year! On January 1, most Americans vow to make some sort of New Year Resolution, behavior change, or as I’d love for you all to call them, “SMART Intentions.” As a therapist and someone who believes in recovery and change, I couldn’t be happier about someone making positive changes to their lives. With every new year comes a rise in reflections and a joyous hope for a better year than last. Unfortunately, when studied (even anecdotally when I think of my own resolutions), most New Year Resolutions get abandoned by the end of January. Some say it’s because it takes a full 30 days to create a new habit, while others say that people aren’t making realistic goals for themselves. As a cognitive behavioral therapist, I’ve implemented the SMART method to goal planning with clients and even myself. The SMART method to starting out your intentions sets up for success, rather than failure. I like the word intention because it is defined as “a mental state that represents a commitment to carrying out an action or actions in the future. 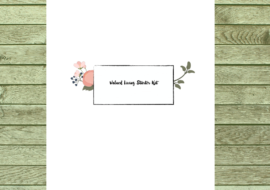 Intention involves mental activities such as planning and forethought.” I also like Intention because, in my opinion, it brings in the compassion in language that is very much needed when introducing behavior change. Specific – You want to be very specific about your intention. Measurable – Your intention must be measurable with numbers. Achievable – Your intention must be the right combination of challenging and achievable. Select something that you’re motivated to do and not too extreme. Example: A healthy weight loss is between 7-10% for most people who are considered overweight. For people who set the bar too high, might get discouraged when their goal number is far from reach or the results are not fast enough. Realistic – Select your intention based on your established resources, environment, support, etc. If your goal is to run outside once a week, and it’s rain season, it’s probably not too realistic. Likewise, if going to gym requires a membership you can’t afford or too far from your home/work, it’s likely not a realistic intention. Realistic example: For this week, I will intend to meet my 9,000 (up from 8,000) step count daily. Realistic example: I will drink 8 glasses of water (instead of juice) by joining the water club at work where I will have access to water at all times. Time-limited or think “Time-line.” – When will it be achieved by? Start off small and realistic given the above factors. Example: I intend to lose 10 lbs (7% of my weight) by June 2018 (6 months from today). First week of January, I will do this by adding more vegetables to my lunches and dinners. Second week of January, I will do this by increasing my steps to 9,000/day. Third week of January, I will do this by joining the water club and drinking 8 glasses of water (instead of my usual soda). Fun Fact: When I was taking my first CBT seminar (as a student), I had to create a SMART goal for myself. I said I would workout 3x/week… it was specific and measurable, but definitely not attainable or realistic given my workload and schedule. Try this with setting one intention for yourself this week. You can also set an intention for your partner, best friends, co-workers, family members and even pets. The possibilities are endless! I urge you all to be kind to yourselves as you’re embarking on this journey of reflection and self-improvement. 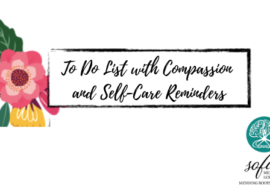 And even if you get stuck, or walk in the opposite direction of your intention (which is super normal in most journeys), notice where you and your emotions are at in that moment (mindfulness practice), and dial back to your intention with the compassionate heart that encouraged you to make this change to begin with. Change your SMART intention if you need to, aren’t being challenged enough, or it’s too hard, or not realistic anymore. And lastly, if you’re the Long Beach area and need help in coming up with intentions for yourself and don’t know where to start, give me a call for a free 15 minute consultation at (323) 351-1741 to discuss your situation and schedule a first session for you. My SMART intention for my website is to post at least 1 blog article per month (or 12 for the year). I will do this by posting draft articles/titles the minute I get an idea. I will spend 2 hours/week researching, writing and editing. 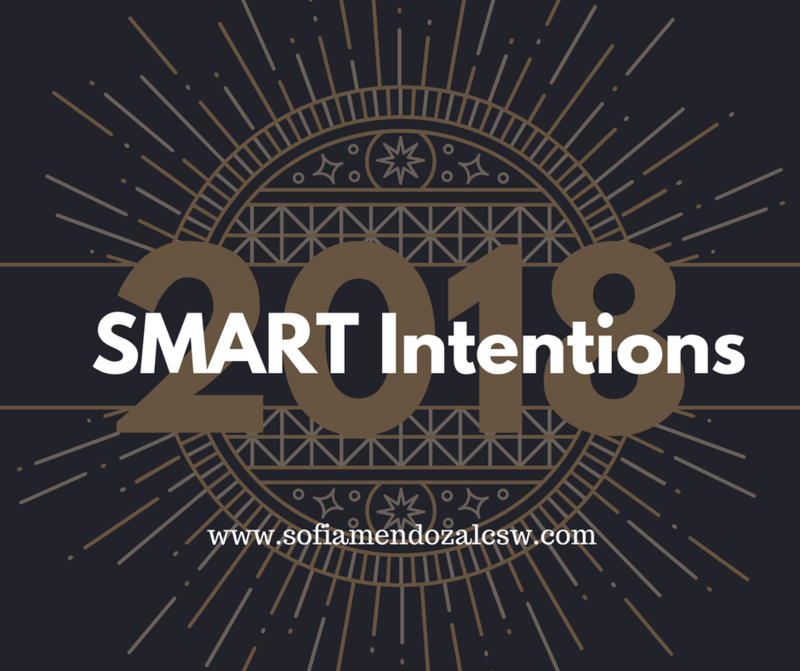 So, what’s your SMART Intention for 2018? So often we forget about the SMART method! It really does help you stay more focused. My one is to loose weight and get fit! I will go gym at least 4 days a week with my husband. So many people fail with their goals because they don’t make them SMART. I’ve always been able to accomplish most of what I set out to do because I sit down and work out the SMART way to achieve them. I wrote a similar post on using the SMART method as well. I think it’s super important to use these steps when creating goal so that they are more attainable. I’ve heard of the SMART goals. It is definitely a good way to go about goals. It also just takes true intentions and really wanting it.